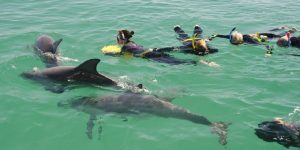 This day tour from Perth offer visitors a unique opportunity to interact with dolphins in their natural environment. You may see mothers nursing their calves, discover how they use stingrays to catch their dinner or simply just watch them frolic in the ocean. The tour includes a transfer from your Perth hotel and begins by cruising Rockingham’s sheltered bays and islands in search of the local dol..
We travel from Perth towards Yanchep National Park for an opportunity to see koalas and kangaroos, before travelling up the coast towards the Pinnacle Desert to view the mystical limestone rock formations. We arrive late afternoon to enjoy a breathtaking sunset and moonrise over the Indian Ocean. We then head to the fishing town of Cervantes for our included dinner in a traditional local tavern t.. 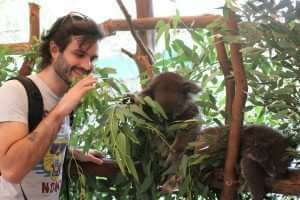 This exciting full day tour begins at Caversham Wildlife Park in the Swan Valley. Featuring over 200 species of animals in a walk-through environment, this park includes friendly koalas, wombats and numerous kangaroos and is run by dedicated wildlife professionals ensuring you have the best opportunity for animal interaction and the chance to hand-feed the kangaroos. Next, we travel to the lobster..